RUSH: Nope. I’m not falling for the trap. I’m not gonna get mired down in this same old formulaic approach to things. We’re not gonna lead off here with the government shutdown like everybody else is talking about, like it’s never happened before, like, “Oh, my God, the Republicans want to screw the poor again.” Not going there, folks. Not right now. We’ll get to it at some point. And the reason is that Trump’s handling this masterfully. The first Republican president to ever pushed back on this stuff and it’s inspiring others. 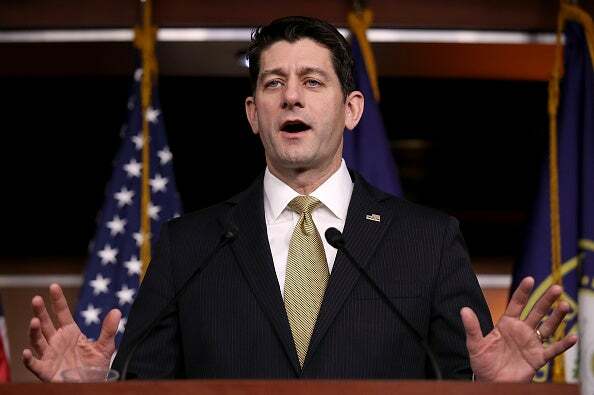 Paul Ryan — look, I’m talking about the government shutdown and I intended not to do it. But I’m just gonna say a brief thing here. Ryan just had his weekly press conference and they’ve settled on a pretty good theory. Do you want to put the military out of business for a while? Do you want to shut down the brave, courageous U.S. military? But the thing is that even if the government shuts down it doesn’t shut down and it’s not gonna shut down. It’s gonna get done. I don’t know how it’s gonna get done, but this is just a formulaic thing. It happens so regularly now, and the Drive-Bys are totally immersed in it for one reason, and that is they cannot wait, once again, to blame the Republicans for it. So given that, I want to start with something else. Greetings, my friends, and great to have you. We’re here at 800-282-2882, and email if you want to send an email is ElRushbo@eibnet.us. I want to start with economic news and some literally incredible things that are happening out there that are not, again, being reported widely in the Drive-By Media. First up, jobless claims. For those of you in Rio Linda, that’s the people showing up at the unemployment office and signing up. Jobless claims in America have plunged to the lowest weekly total since 1973. This accompanies record-low African-American unemployment, not just the low for the year, and not just the low for this century, record-low African-American unemployment since it was first tabulated, which was in 1972. Barack Obama did not do this. George W. Bush didn’t do it. Bill Clinton didn’t do it. Nobody has done this. It’s never been this low before. It’s just barely over 6%, African-American unemployment, and the same for other minorities as well. Hispanic unemployment is also trending way, way down. Now, I submit to you that your average low-information voter reading this will see “job market will tighten further,” and they will interpret that to mean it’s getting worse, when it’s just the exact opposite. The job marketing tightening means there are fewer jobs to get because so many jobs are being filled. And when that happens, it’s called a labor market, meaning an employee market, meaning that the employee is more prized than ever and has more leverage than ever. Where there’s a shortage of people to fill jobs, that gives leverage to people who are in the job market and have marketable and demonstrable skills, they have the ability to demand more. So this is all good news. And yet, “In a sign the job market will tighten further,” meaning, “The job situation’s gonna get even worse as this year goes on.” It’s irresponsibility. Now, yesterday we broke the news here of Apple and what they are intending to do directly because of tax reform, and Tim Cook, the CEO of Apple, has admitted that it is because of the tax reform act that they are repatriating $250 billion — almost, what is it, two-thirds of Apple’s business is international. It’s either two-thirds or 75%. They sell a tremendous amount of product all over the world and they sell a ton of product in America of course, but when you add all the products sold in all the other markets, that’s a tremendous amount of money. And they had 250, $260 billion parked overseas as a result of sales overseas that they were not bringing back to the United States because of the high corporate tax rate of 35%. Tax reform includes a one-time repatriation rate of 15%. So Apple has decided to bring back a quarter of a billion dollars. They’re gonna repatriate almost all of it at a tax rate of 15% instead of 35. 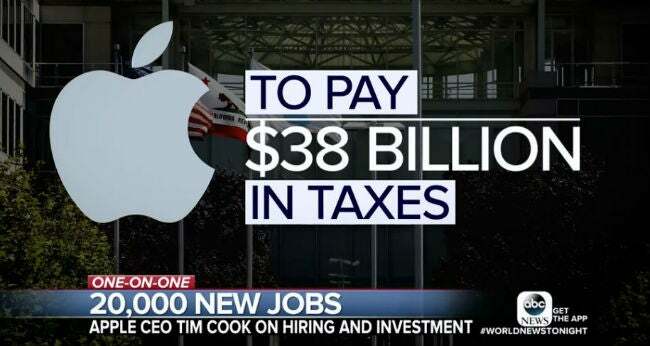 And even at that Apple will be paying 37 to $38 billion in taxes, even at a 15% rate on their 250, $260 billion. And they’re doing this happily. Apple is also going to inject $350 billion into the U.S. economy. They’re building a new campus somewhere. They haven’t announced what state. The only thing they’ve said is it’s not gonna be in California or Texas. They’re gonna be hiring 20,000 additional employees above and beyond the 150,000 employees they have now. This news has not yet appeared on CNN. It has not yet appeared on MSNBC. I don’t know if it’s shown up in the New York Times or the Washington Post, but ABC’s World News Tonight did a six-minute feature on this last night featuring an interview with Tim Cook in Reno where they were breaking ground on a new data center. Why not mention this? CNN, MSNBC, no mention of the records set on Wall Street yesterday or of the decision by Apple to bring billions of dollars of cash back into the country, which is gonna result in $38 billion in taxes paid to the federal government. And make no mistake, Millennials like that. The government being funded means more compassion. The government getting more tax revenue means more sensitivity and more compassion and more sustainability and all of that yuk-yuk. So why not mention this? And the reason’s very simple: CNN’s not talking about it, MSNBC’s not talking about it because it’s all because of Trump. It’s all because of Donald Trump and the Republican tax cuts. And, remember, CNN’s had guest after guest after guest saying that it cannot be proven that lowering the corporate tax rate will give more money to American workers. They’ve had guests, panels upon panels of supposed experts claiming that this is not gonna happen. And yet it has happened, and it is happening. We’re up to almost 200 companies now extending bonuses. Apple’s bonus, you know what their bonus is? Every employee gets $2,500 essentially of stock options. Which, at Apple’s stock price, ain’t bad. It’s $2,500 reserve stock units, essentially, but they’re extending stock options to employees. So $2,500, in addition to other benefits and the otherwise overall company expansion. And look what’s happened in addition to that. Here we are lowering the corporate tax rate in this one-time repatriation rate, 35% to 15%, and what’s the result? The government is getting $38 billion it didn’t have at a 35% tax rate. 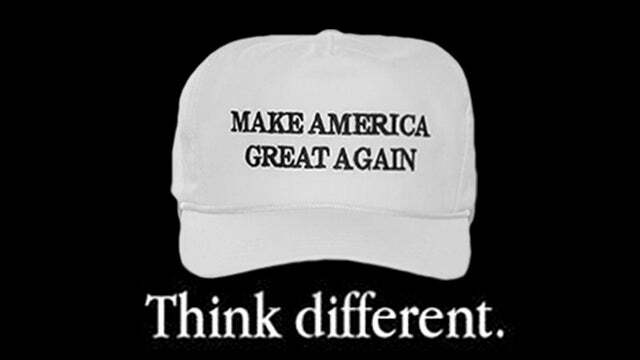 Now, CNN and MSNBC and every other liberal economist out there tell us that cutting taxes will never raise money for the government, cutting taxes doesn’t do that. Cutting taxes costs the government money, they say. Cutting taxes is irresponsible, it’s trickle-down, it doesn’t work. Well, right here, Millennials, $250 billion Apple had parked overseas helping nobody but Apple. Trump Republican tax reform comes along, one time repatriation tax rate, not 35%, but 15%, Apple says, “Hell, yes, we’ll bring it back.” So $250 billion brought back that would never have seen the United States light of day, and $38 billion of that goes to the precious, devoted United States government. They would have never seen it had there not been a tax cut. Real life, the real world has demonstrated once again the folly and the lying that is routine for the Democrat Party and the American Drive-By Media. JARVIS: So it sounds like President Trump’s tax bill has been a huge windfall for Apple! 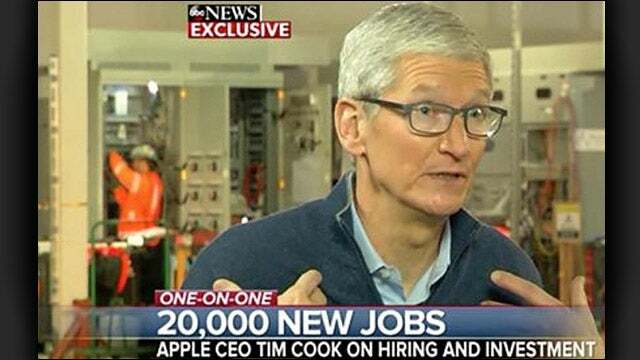 COOK: I do believe the corporate tax side will result in, uhh, job creation and a faster growing economy. A windfall for Apple? Apple has pledged to inject $350 billion into the U.S. economy. A windfall for Apple? Only in the sense that that money they’re investing is gonna grow the company, yeah. What is this windfall for Apple? They just paid $38 billion in taxes they would not have otherwise paid. But this infobabe thinks this is a windfall for Apple. It’s a windfall for the United States! It’s a windfall for American employees of Apple. It’s a windfall for the United States government, for crying out loud. It’s everything we’ve always told you about tax cuts raising revenue for the government. And it again raises the question: Why do liberals not care about this? They claim to care about deficits, they claim to care about responsibility and all of this. Why, when government is getting so rich — why, when a tax cut generates more revenue to Washington — do they not support tax cuts? Because they have calculated that it’s much easier to beat up corporations and the rich to the benefit of the Democrat Party than to talk about government growth. It’s a toss-up for ’em. But it illustrates that all this concern about government not being short-changed and government getting more money is really of no concern to them. It’s just a talking point. So even after the question, “So, it sounds like President Trump’s tax bill has been a huge windfall for Apple.” Tim Cook said, “I do believe the corporate tax side will result in job creation and a faster growing economy,” which, if you’re the CEO of Apple, is great news, because the better off the American people are, the more likely they are to be able to afford your products and other products and other services. In a number of instances, Tim Cook lately… It’s kind of interesting. Tim Cook lately has been thrown softballs from various members of the Drive-By Media with an opportunity to just hammer Donald Trump, and that was another one. And he didn’t take it. He didn’t swing at the softball. He didn’t lay in to Donald Trump, and he very easily could have. The reason is, folks, this news is undeniable. This is gonna grow companies. It’s gonna grow employment. It’s gonna grow the economy. And there’s not a single Democrat that voted for this. Not a single Democrat in the country voted for this. This $350 billion U.S. investment, 20,000 new jobs, is thanks to tax reform. It’s $350 billion invested! You talk about a stimulus? This is half of Obama’s Porkulus bill, and this one’s real. This $350 billion in U.S. investment, 20,000 new jobs because of tax reform. Not a single Democrat voted for it. Apple has committed to directly investing half as much money as Obama’s ill-fated Porkulus bill. They’re gonna pay $38 billion in taxes they otherwise wouldn’t have paid, happily. Every Democrat in Congress voted against what made this possible. Every Democrat in Congress has voted against what has triggered millions of dollars of bonuses for the American people. Every Democrat in Congress has voted against the individual pursuit of happiness. Every Democrat in Congress preferred the government’s greed over the generosity of private individuals and the companies they own and operate. Under Obama, what grew? Food stamp usage, health care costs, health care insurance costs, energy costs. What became better? Where was the prosperity during the eight years of the Obama administration? It wasn’t there for the average American people in the middle class. Under Trump, bonuses, wage increases, stock portfolios, disposable income, consumer business confidence are expanding to record highs. Unemployment is plunging to record lows, including African-American unemployment — and we’re not finished. There’s much more room to grow. This is just the beginning. This is just ignition. The Trump Dividend is what this is, and it is sustainable. Food stamps or disposable income? What do you want? Well, you get to choose now. That’s the beauty of elections. You want more food stamps, you want higher health care costs, you want to be told you have to buy health insurance that you can’t afford, or do you want more disposable income to choose your own decisions with your own money? How will you vote?